Final decisions about the President’s FY2012 budget recommendations are being made now, making it a critical time to take action. Cuts to the entire federal budget have been proposed – including NIH. Please remind the President that a robust investment in science is critical to creating jobs, improving health, encouraging innovation and revitalizing the economy. Take action now. Urge President Obama to maintain his commitment to “restore science to its rightful place” by proposing and fighting for $35 billion in NIH funding in FY2012. Today is the Great American Smokeout—a time for smokers to quit, even if just for a day, but hopefully to make a plan to quit forever. Are you tired of hearing about the harmful effects of smoking? I’m sure you’ve heard them all before. But please take today to really listen to the reasons and think about them. They should help convince you to quit smoking today and always or, if you’re not a smoker, help a loved one to quit. Yes, you know smoking causes cancer, but did you know tobacco use is responsible for 30% of the cancer deaths in the US? 30 percent! And only about half of the deaths caused by smoking are from cancer. Smoking is linked to heart disease and stroke and causes painful conditions like chronic bronchitis and emphysema. A sobering statistic is that half of all the people who continue smoking will die because of it. So, if you and your spouse have this habit together, chances are it will kill one of you. 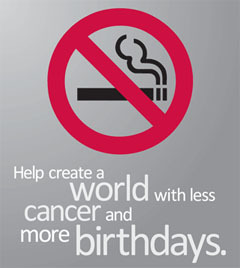 To make it even more real, smoking shortens male smokers’ lives by 13.2 years and female smokers’ lives by 14.5 years! What would you be missing in those 13 years? Is smoking really worth that? Smoking is the single most preventable cause of death. It’s very powerful to know that you can prevent death simply by not smoking. Research!America and many other organizations dedicate themselves to improving the health of the nation. We advocate for more funding for research so that we can find new drugs or understand diseases better, all so people can live longer. But you don’t have to be an advocate or a scientist to reach that goal. If you quit smoking or convince someone else to, you can prevent illness in the first place, so those drugs aren’t needed. Smoking-related illnesses and treatments come at a huge cost to our society. Smoking costs more than $196 billion each year in health-related expenses; for the individual, this means about $2,247 in extra medical expenses for each adult smoker per year. Do you have an extra $2,000 lying around to spend on preventable costs? What else could you buy for that money? Many people are worried about our economy and the cost of health care these days, with good reason, but quitting will decrease that cost without added expense. In fact, you would additionally be saving the money you might otherwise spend on cigarettes. Someone who smokes half a pack of cigarettes a day spends around $75 per month on cigarettes or about $912 per year, money that could easily stay in your pocket. The good news is that the benefits of quitting start immediately. Only 12 hours after quitting the carbon monoxide level in your blood returns to normal. One year after quitting, your risk of coronary heart disease is half that of a smoker’s, and it's the same as a non-smoker’s 15 years after quitting. Ten years after quitting, your cancer risk decreases and the lung cancer death rate is about half that of smokers’. So join Americans in quitting smoking today and make a plan to quit for a lifetime. Much of this information came from the American Cancer Society. Visit their website for more information and tips to help you quit. Stacie has been at Research!America for nine years. She is now transitioning to operating her own business, where she will continue working on science and health policy in her home state of Alabama. What will you be doing in your new position? Fortunately, I will continue the work I have been privileged to do on behalf of Research!America but with a more local focus. With University of Alabama at Birmingham as the largest employer in the state, Alabama and the southeast has the opportunity to become a research and development powerhouse. My goal is to make any contribution I can to increase Alabama’s R&D competitiveness nationally and globally. What is the most challenging part of what you do? Getting stakeholders in research to come together and push in one direction is always challenging. If united, the research advocacy community can achieve almost anything. When did you first become interested in advocacy? When I was in graduate school, I watched several congressional briefings on embryonic stem cell research. Watching these made me realize that Congress must have a hard time understanding these complex scientific issues. There was a clear need for a more diverse range of voices for science and I wanted to help my peers speak out about the value of their work. At the same time, I was watching many brilliant and highly trained young investigators struggle to get funding for their research. I figured if there was more money allocated to research, more transformative ideas could get funded, benefiting all of us. I decided that instead of complaining, I would get out and do something about it. I knew Washington, DC was the place to get the national experience I needed to really make a difference back home. What advice do you have for someone interested in advocacy and/or outreach? I know the hardest step is getting started, so you just have to get involved, even if only a little bit at a time. You can start by volunteering outside of the lab. Being an advocate will be easier if you’re involved in your community. You have to be proactive and make advocacy a priority. And, you may have to make some hard choices. I had to leave research and overcome the stigma of doing so and also move across the country where I didn’t yet have a job. But when action meets vision, you can get a lot done. We thank Stacie for sharing her experience and advice, both for this article and through her time at Research!America. We wish Stacie the best of luck and know she will be successful! When I hear the Declaration of Independence describe our unalienable rights--Life, Liberty, and the Pursuit of Happiness—it puts this sentiment more into perspective. Mahatma Gandhi said, “Happiness is when what you think, what you say, and what you do are in harmony.” We are lucky to have the freedom to put those paths in harmony. So I challenge you to think about what makes you truly happy and to make an effort to pursue those aims. Many of us take for granted our true wells of happiness. Sometimes I need to stop worrying about the small things, like the clean house, and embrace the bigger picture, like my amazing family. For me, happiness comes from feeling like I am contributing to society, being intellectually stimulated and spending time with my close friends and family. Notice that none of these things include having more money or material goods, and a clean house is never mentioned. I am lucky to have a position that allows me to fulfill all of these roles, which keeps me happy on a daily basis. Although I am no longer a researcher, I am able to pursue my goal of advancing biomedical research. As a science policy fellow, I feel that I am using my knowledge and skills to benefit society—I can understand the science and translate it in order to advocate for better health. I am able to continue learning and discussing biomedical issues, my intellectual passion. And, though I have limited social time, I savor every moment with my friends and family. There are many opportunities to contribute to your happiness outside of work as well. You just have to determine what really matters and find a way to incorporate it. Every day, strive to keep in perspective the most important things in life. A recent Research!America survey found that 87% of Americans think it is worthwhile investment. Throughout the past few election cycles there has been a lot of discussion about budgets and military spending, but the health benefits Americans gain from research conducted by the military on disease prevention, surgical techniques, safety gear, and any number of other topics doesn't just stay within the armed services. It comes back to the community as body armor for police, vaccines for travelers, limb replacement techniques, better football helmets for kids, and safer vehicles on the road. While you're thanking veterans for their service today (and everyday!) don't forget to thank them for the extraordinary research they're doing too. Welcome to New Voice Allison Bland, Communications Program Assistant at the American Society of Clinical Oncology (ASCO). Allison: I help maintain ASCO's patient website, Cancer.Net, by working with oncologists to review and update the latest information on cancer treatment and care. I also work with Cancer.Net's social media on Twitter and Facebook. Allison: Another part of my job is to help answer phone calls, emails, and letters from people with cancer and their families. People turn to ASCO looking for resources at any point during their cancer treatment. I help these people by directing them towards the best resources and information, but it can be difficult because I'm not able to give medical advice. Many times, patients are very educated about their diagnosis and come to us looking for the next step. It's challenging to explain complex medical information to someone who is dealing with a cancer diagnosis over the phone. Allison: My dad is a physicist, but he never pushed me towards a career in science. I have always been a writer, and dabbled in science because I was interested in how new discoveries can make the world better. Combining the two led me to science communication, and I'm following that track now. Allison: I think one of the most common misconceptions about scientists is that there is a single-track, vaguely defined career for a "scientist." The reality is that there are many kinds of jobs in the science field, and these types of jobs are becoming more important all the time. Allison: Take full advantage of online tools. The communities that form around online platforms like blogging networks or Twitter attract people who know the issues and have similar interests in science outreach and advocacy. I think the best way to get involved is through participation in online communities and then finding face-to-face events -- conferences, science cafes, happy hours -- to take the next step. Some of you may remember that Allison was a contributor to the New Voices blog. We thank Allison for sharing her experience and advice about science communications and advocacy. This is part of the ongoing Profiling New Voices series. My co-blogger Kate found these awesome videos from a Science competition to "dance your PhD." At New Voices we're constantly trying to think of ways to communicate science so everyone can understand it, and these are some great examples! Congratulations to the winners (two are below). I have always been interested in learning how things work, particularly the biology in the world around me, which is why it wasn't surprising for me to major in Biology. I don't know when I picked up this curiosity in living things, but it could have started with my love of reading and the books I chose. I've compiled a list of books, both fictional and true, that will stimulate young adults' interest in learning about science. Death Be Not Proud by John Gunther. A touching true story following the author’s son’s battle with a brain tumor at 17. John Gunther describes Johnny’s selflessness and courage as he struggles with the transition from a curious, budding scientist to clinical research subject. The Scent of Desire: Discovering Our Enigmatic Sense of Smell by Rachel Herz. This book explores the sense of smell and its importance to our lives. The author is able to clearly describe neurobiological principles and make them interesting. This book is sure to stimulate your curiosity in psychology and neuroscience. 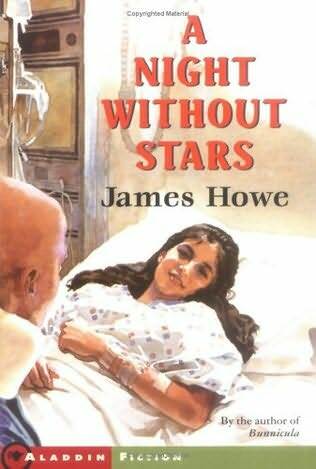 A Night Without Stars by James Howe. A young girl must undergo open-heart surgery, but no one will tell her what’s going on. This story explores her fear and her friendship with another patient at the hospital. 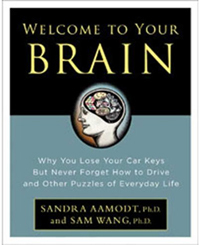 Welcome to Your Brain: Why You Lose Your Car Keys But Never Forget How to Drive and Other Puzzles of Everyday Life by Sandra Aarnodt and Sam Wang. An “owner’s manual” for your brain, this book covers a wide range of everyday topics helping describe how the brain works. Welcome to Your Brain manages to be informative, interesting and easy-to-read. Too Young to Die by Lurlene McDaniel. A talented high school student learns new lessons when she is diagnosed with leukemia. This is a touching story of friendship and life that also describes the diagnosis of cancer and the treatment process. A moving and informative story for all young adults learning about life. Happy Friday! We gathered some of our posts together to keep you entertained this beautiful fall weekend. Enjoy! There is sure to be football on many TVs this weekend. Keep this in mind while watching your favorite football team. Or, for those of you who don't watch football, here's something else to watch: our list of 5 great science movies to curl up to this weekend. But if movies and TV aren't your thing, we've also compiled some fun books to help you unwind. Last week, we started talking about the different types of blood cancer: leukemia, lymphoma and myeloma and the importance of research into them. I hope you are gaining an understanding of some of the distinguishing characteristics. Furthermore, lymphomas are classified as Hodgkin lymphoma and non-Hodgkin lymphoma. Hodgkin lymphoma is defined by the presence of a certain type of large, malignant (cancerous) cell, called a Reed-Sternberg cell, in the lymphoma tissue. Non-Hodgkin lymphoma is a diverse group of cancers containing the remaining types of lymphoma. I only go through all this because, as I mentioned last week, these are each very distinct diseases. Hodgkin lymphoma is more common in children and young adults. In contrast, the risk for developing non-Hodgkin lymphoma increases with age and typically appears between the ages of 40 and 70. The median age of a myeloma patient is 70-years-old, and it rarely occurs in anyone under the age of 45. Of the leukemias, children most often develop ALL, whereas adults most often develop AML. Gleevec is a successful treatment for CML patients with a particular mutation, called BCR-Abl, but it is not used to treat CLL. There is still a lot of work to be done so that we can understand all the differences among these diseases. One area under investigation is understanding the different genetic changes that cause the cancer. The next step would be to identify which genetic change, or mutation, each patient has, and then they can receive the best treatment for their disease, called personalized medicine. For instance, a patient with the BCR-Abl mutation can be given Gleevec, and a patient who does not have that mutation can be given a different treatment, because Gleevec won't work for them. Researchers are working hard to identify cancer-causing mutations as well as therapies targeted to those mutations. This type of innovative research will help increase the five-year survival rates for all cancers. We had an election yesterday, and, as you've no-doubt heard, many members of Congress lost their seats. Interestingly, they haven't yet lost their jobs. The newly elected members of Congress don't take their seats until January 3, 2011, and, because the exiting Congress was unable to finish some important matters on their agenda before leaving for campaign season, they will have to return after the election. This is commonly referred to as a lame duck session. There is a lot of fear of the lame duck session, particularly of the lame duck members who lost their seats in the election, because they are thought to no longer be accountable. There is whispering that these members might pass bills that wouldn't have been debated during the campaign season or that won't get passed in the next Congress. This fear is especially rampant in years that a congressional house changes party, such as this year. However, Norman Ornstein argues that many of these fears are unfounded. Besides, it’s perennially the incoming party that is fearful of a lame duck Congress…until it’s their turn. Most of the whispering is just hot air. In fact, the lame duck session is incredibly important, not something to fear. Any bills that are still pending at the end of this session are considered dead and will have to be reintroduced in the new Congress and go through the whole process all over again—what a waste of time! The lame duck session will allow many of the pending issues one last chance to be debated before going to the graveyard. An incredibly important piece of legislation that we hope this lame duck Congress will take up is the Stem Cell Research Advancement Act (H.R. 4808 and S. 3766), which would allow federal funding of embryonic stem cell research (ESCR). As we've seen in the past few months, the funding for this important area of investigation is volatile, with a single judge able to gridlock the country’s research. Fixing this problem is time-sensitive because we cannot afford to have these gridlocks occur over and over again. Research cannot be stopped and started intermittently, particularly when working with sensitive materials like embryonic stem cells. It can take researchers weeks or months to prepare for important experiments--that time is lost when research is halted, and doubled when research is restarted. Furthermore, if these experiments are discontinued prematurely, all the data can be lost. ESCR legislation has been passed by both houses of Congress twice before, only to be vetoed by President Bush. 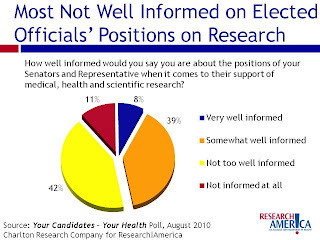 In addition, Research!America polls show that a majority of Americans think that the government should fund ESCR. So why don’t we have a law to reflect how the people feel? Please, urge your representative and senator to pass the Stem Cell Research Advancement Act (H.R. 4808 in the House and S. 3766 in the Senate) this year. Let’s put those lame ducks to work. You might have heard, there’s an election today. Or maybe you haven’t. I know when I was a student at The Ohio State University, the only midterms I was worried about were exams. Looking back, I realize that I missed an opportunity to make a difference: to make a difference in how the job market would look when I graduated; in whether or not I’d be covered by health insurance; or if the United States would be going to war. All because I didn’t vote. I wasn’t alone. Midterm elections historically have low turnouts. In fact, in 2006 only 25 percent of 18- to 29-year-olds voted. That’s a shame because choosing who sits in Congress is just as important as who sits in the White House. The members of Congress we vote for in midterm elections are the ones who debate the policies that shape our country. They represent us and are our voices nationally. It’s our job to make sure the candidates who best represent us get into office and fight for the issues we care about. For me, the big issues this election are the economy and the future of scientific research. Scientific and medical research is a big driver of the economy, creating jobs and bringing money to the state – especially in a state with a huge research university like OSU. In fact, last year Ohio received more than $1 billion in funding from four federal health agencies for research. 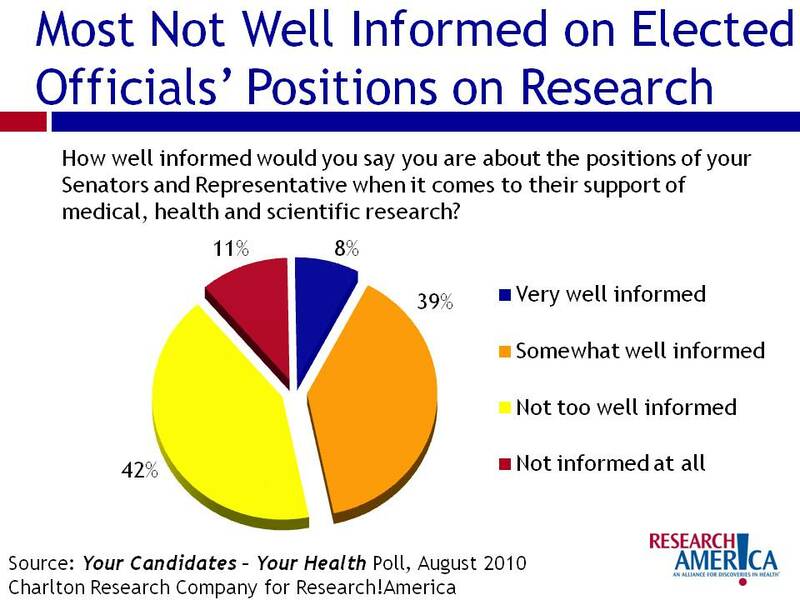 Americans consistently describe both health and research as important, yet just 8 percent say they are well-informed about their elected officials’ positions on these issues. That’s not how it should be! If health and research are so important, they should be at the forefront of our voting decisions. As a fellow at Research!America, I’ve been working on Your Candidates – Your Health, an online voter education initiative designed to fill the information gap. Every candidate for Congress has been invited to complete a questionnaire addressing health and research issues. This website is a tool to inform voters like you of how candidates feel about the importance of research and the role it plays in the economy and improving our health—before the elections. So visit the site to see what your candidates think. Let your candidates know that these topics are important to you and our country, and urge them to answer the questions if they haven’t already. Your vote is your voice. November 2nd is your chance to speak up. Today is election day. You must go vote to have your voice heard. 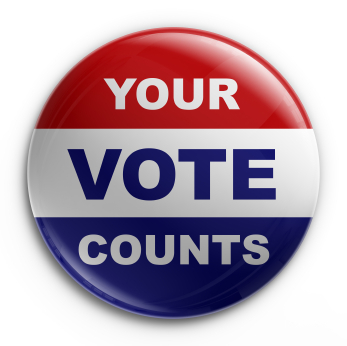 No matter your party or the issues you care about--just VOTE! Find out where your elected officials stand on the issues important to you, then grab your ID and head to your polling place. Vote. Know your vote. Let your voice be heard.